The Artcommune Gallery prides itself on being the first gallery in Singapore where artists can be found alongside their artwork. This allows visitors the opportunity to speak to the artists about their work, providing you with professional advice on art collection, conservation and investment in art pieces. Artcommune features some of Singapore’s most well-known artists, including 1st and 2nd generation Singaporean artists like Cheong Soo Pieng, Lim Tze Peng and Chen Wen Hsi. The gallery hopes to encourage the development of Singapore’s art community by nurturing local artists and creating a sustainable business model for them to showcase and advertise their works. As a result, the gallery is arguably Singapore’s largest collection of high quality art, and is also a fantastic point of entry for visitors would like to further their education in the fine arts. 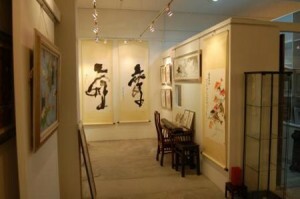 Artcommune Gallery is located at #02-43 Bras Basah Complex, which is a short walk from City Hall or Bugis MRT stations. Admission to the gallery is free of charge. The gallery is open from 12 noon to 7pm daily. More information on artcommune Gallery can be found on its website here: http://artcommune.com.sg.